By Lee Patterson. JoPaul Arbizo Jr. and Manny Aparicio sign their letter of intent to Doane University. 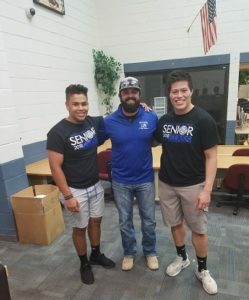 The Safford Bulldog football class of 2018 has produced two more college football athletes. 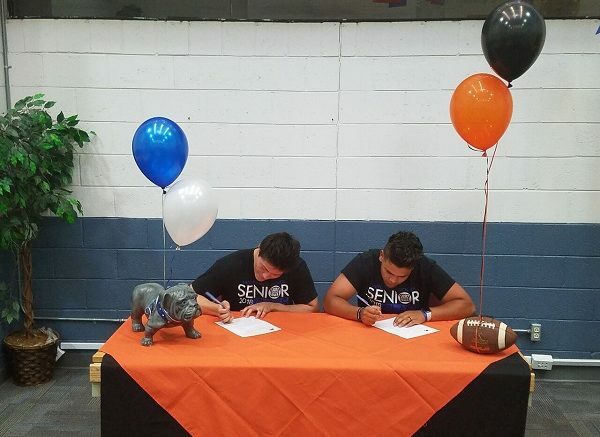 JoPaul Arbizo Jr. and Manny Aparicio have both signed to play football at Doane University in Crete, Nebraska. Doane University is a member of the Great Plains Athletic Conference competing at the NAIA level. The pair’s former Head Coach, Mike Alba, who coached them each for four seasons isn’t surprised they are both headed to the next level. “These two were always leaders on and off the field,” said Alba. “They will do great things at the next level and I’m excited for them,” he added. L To R – Manny Aparicio, Mike Alba, JoPaul Arbizo Jr.
Arbizo and Aparicio will be roomates at Doane and both raved about the town and athletic facilities. “Once I took my visit I knew that Doane was the place I wanted to be, it’s beautiful out there,” said Arbizo. The Doane coaching staff will utilize both players on the defensive side of the field. The duo will have a new head coach to impress when they arrive in Crete on August 7th. Former Head Coach Matt Franzen has has been named as the new Athletic Director. Chris Bessler will be the new Tigers head coach after serving as Defensive Coordinator for 11 seasons. Doane finished last season 5-5 and will open their 2018 schedule on the road in Wichita, Kansas at Friends University on August 25th.